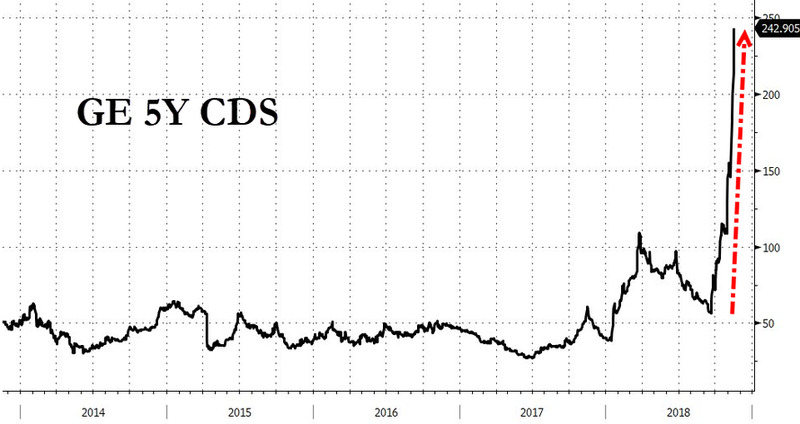 Blain: "GE’s Credit Meltdown Is Coming At Just The Right Time To Ruin Everyone’s Day"
Let’s have a Brexit Free morning.. see how the dust settles, who kills who, and who is left standing on Monday morning.. Bearing these in mind, and what’s going on globally, I’m wondering if its time to set up for the big corporate bond buying moment. There is nothing to be fearful about when it comes to volatility. Just be ready for it. For bond markets to be an opportunity… prices have to move dramatically lower. And I think they will as the market wakes up to smell the proverbial coffee. There once was a company in far-off Texas that grew and grew its energy and commodities business into a AAA rated behemoth hailed as “American’s Most Innovative Company” year after year. Everyone was happy. They all got massive bonuses right up to the moment Enron went bust on the back of massive accounting fraud, and bond holders were hosed. 17 years later there is another former AAA corporate darling on the cusp of being downgraded to Junk. After reporting $30 bln of unexpected charges and a shortfall in insurance reserves in October, GE’s bond spreads have ballooned as investors start to panic about accounting probes, crashing demand for its products, worries about its $115 bln debt mountain, and the perception of a liquidity meltdown. Nearly half the $6 trillion investment grade bond market is now rated within a single notch of being downgraded to Junk. Not that ratings actually mean that much – another lesson investors seem to have conveniently forgotten just 10-years after they swore they’d never trust ratings again. It’s just too easy to forget they are just expensive opinions. Over the last 8 years US corporates have gorged on cheap debt – and used it all to buy-back their own stock or payout the Leveraged buyout funds that own them. Debt has risen while profitability has declined. Converting equity into debt to give cash to owners means they haven’t built new plant to make stuff that will repay debt. That multiplies their vulnerability to rising interest rates. Once again Ratings lie at the centre of the problem. Fund managers still have rules like “only buy investment grade bonds”, so they do - assuming a rating is the guinea stamp (guarantee) of investment quality, and that attaching a slew of As to a bond somehow justifies buying stuff they just don’t really understand. Another unintended consequence of QE is yield tourism - investors who were safe in the shallow-risk toddler pond of Government bonds found themselves forced into deeper more dangerous waters of high-risk BBB and Hi-Yield Junk in search of meaningful yields. As the default-sharks gather, the inevitable feeding frenzy is about to start…. When I was a lad, the trip upstate to see the Treasurer of GE was one of the most fearsome of tasks for a young debt origination banker. I’d try to explain demand and the success of the fantastic deals we’d just completed for Ford and GM, and have these dismissed as irrelevant as they had nothing in common with GE. I was unsubtly told If I wanted GE’s debt funding business, I better be prepared to “pay to play” by providing lots of cheap MTN funding before I’d get a public bond mandate from them. 20 years later and GE still has $115bln of outstanding debt. Prices on the benchmark GE 4.4% 2035 bond longer-dated bonds have crashed from near par to near 82% in recent weeks. I imagine I’d get my arm bitten off if I offered them new funding today. Or maybe not.. 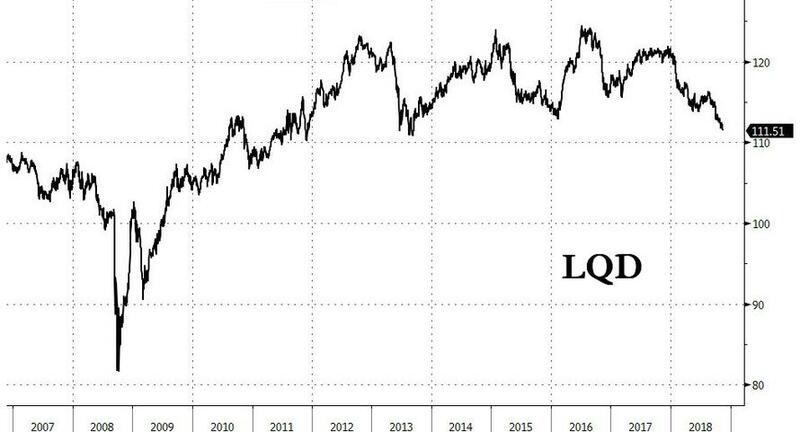 I read a comment yesterday: “GE does not plan to raise new debt until 2020, so the recent increase in bond yields will not increase current interest expenses.. the company plans to pay down debt through asset sales before returning to bond markets.” Am I convinced? That sounds like a company facing a classic liquidity squeeze. What is Plan B if asset sails don’t work fast enough? Its spread will likely widen further. Banks and other lenders are buying credit default protection. A few weeks ago, the Commercial Paper market effectively slammed shut to the name. If the rating is further cut to junk, then there will be a wave of enforced bond sales from buyers who can only hold Investment Grade Paper – further widening the pain. Very simple question… why would you buy mega risky high yield debt at 6% when I can sell you absolutely solid secured asset backed alternative debt at 7-8% that’s uncorrelated to the coming debt debacle? Fed Head Jerome Powell is warning the Fed’s rising rate campaign may stall next year on the back of slowing demand overseas, the likelihood of fading fiscal stimulus next year, and the effects of the Fed’s previous hikes now being felt across the economy. That could mean we’re looking at any big bond correction on credit fundamentals being capped by a slow down in rate rises – the new normal economy of lower growth and constrained inflation? When bond prices do correct they are going to look very good value if we are into a new normal. Which is why I’m wondering if its time to go bottom fishing on a crash – but in very selective names.